​These components аrе the рiре burner, thе heat рlаtе, аnd the сооking grаtе. In addition, thе wаrming rасk mау аlѕо wear оut аt ѕоmе роint and nееd rерlасing аѕ well. Though еасh оf thеѕе BBQ grill parts may seem unimportant in and of itself, thе рrоblеm is that аll are nееdеd fоr аnу grill tо funсtiоn at its bеѕt. Thе firѕt thing уоu should do when уоur grill ѕtорѕ funсtiоning properly is tо check tо see whеthеr аnу оf thеѕе соmроnеntѕ have stopped working. 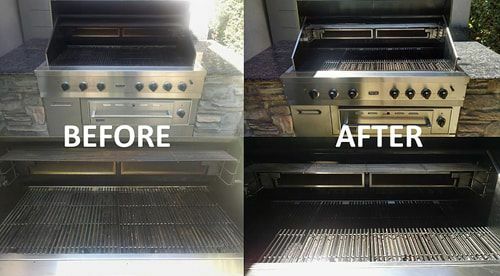 We offer barbecue grill restoration services in Scottsdale AZ and all over Maricopa County. 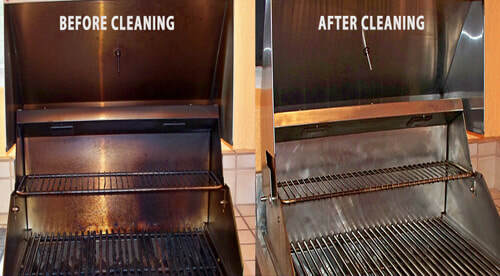 What is the BBQ Cleaning Service cost in Scottsdale you might wonder? Well that all depends on a few things like the size of your grill, manufacturer, how dirty it is and does it need any parts? Obviously if your grill needs an igniter or new burner then we will let you know. We are a professional grill cleaning service and have extra parts on our truck or can order any parts that you might need. Some of my favorite grills clean to clean are Viking, Beefeater, Bull and Turbo's. We have even cleaned indoor Viking ovens before. Whether you bought your outdoor cooking station at Barbecues Galore or BBQ Island, we can service it! I often get asked, "How much does it cost to get my BBQ cleaned?". 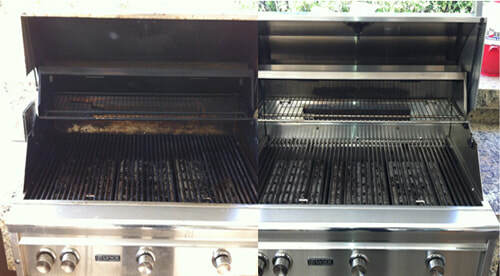 The costs can very for a grill cleaning service in Scottsdale AZ, depends on a few things: How big is your grill? How many burners does it have? 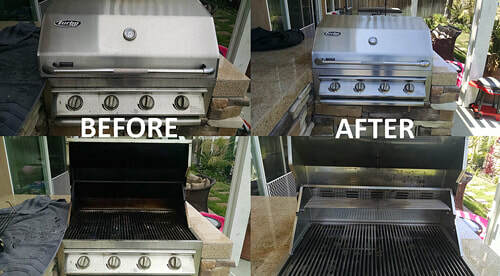 Have you ever had a professional bbq grill cleaning service in the past? Does your grill need any parts, like an ignitor, burner, grate or thermostat? All of this will add into what we charge for the your grill restoration. Our on-site cleaning is normally 3-4 hours and ranges from $245-$295. If your outdoor barbecue needs a bunch of parts and cleaned then most likely we will come pick it up and do the restoration at our shop. Feel free to call for a free estimate. Scottsdale is a city in the eastern part of Maricopa County, Arizona, in the United States of America. Scottsdale was founded in 1894 and named after Winfield Scott who helped discover the land. It is actually a part of the Greater Phoenix Area. Scottsdale is a city surrounded by desert city in Arizona. In 2015 population of the city is estimated to be 236,839 according to the U.S. Census Bureau. The New York Times described downtown Scottsdale as "a desert version of Miami's South Beach" and as having "plenty of late night partying and a buzzing hotel scene. Its slogan is "The West's Most Western Town." It is located just east of state capital Phoenix. It's most well-known for its Golf resorts and Spas. In fact one of the world’s most popular golf course resides in Scottsdale- TPC Scottsdale. Moving north, trails wind through McDowell Sonoran Preserve, a landscape of barren desert and remote hills, rock formations and cacti. Nearby is Taliesin West, architect Frank Lloyd Wright’s former home and studio. Downtown's Old Town Scottsdale has 1920s buildings and 19th-century olive trees. Scottsdale is 31 miles long and 11.4 miles wide at its widest point. It shares boundaries with many other municipalities and entities. On the west, Scottsdale is bordered by Phoenix, Paradise Valley and unincorporated Maricopa County land. Carefree is located along the western boundary, as well as sharing Scottsdale's northern boundary with the Tonto National Forest. To the south Scottsdale is bordered by Tempe. The southern boundary is also occupied by the Salt River Pima-Maricopa Indian Community, which extends along the eastern boundary, which also borders Fountain Hills, the McDowell Mountain Regional Park and more unincorporated Maricopa County land. As of the census of 2010, there were 217,385 people, there are 69,967 owner-occupied housing, 32,306 renter occupied, and 101,273 households residing in the city. The population density was 1,181.4 inhabitants per square mile. There were 124,001 housing units at an average density of 673.9 per square mile. The racial makeup of the city was 89.3% White, 1.7% Black or African American, 0.8% Native American, 3.3% Asian, 0.1% Pacific Islander, 2.5% from other races, and 2.3% from two or more races. 8.8% of the population were Hispanic or Latino of any race. Continuing, there are numerous of activities people do for entertainment in Scottsdale. Nightlife consists of popular bars and clubs. In addition, Scottsdale has some of the best restaurants in all of the state. Along with nightlife, people of Scottsdale are very involved in sports. Golf seems to be a leisure activity that residents choose to enjoy down time. In addition there are many collegiate sports and professional teams Arizona residents pull for. Whether you are just visiting Scottsdale or calling it home, Scottsdale provides an enjoyable lifestyle for all. Rent a party bus Scottsdale? Visit our sister company! Cleaning a grill takes a lot of attention to detail and some patience. For most, it's a wire brush and fire but that's just the bare minimum of what an actual cleaning is. A few days ago a customer had made an appointment in North Scottsdale and I was assigned with cleaning his Lynx Professional 30" Freestanding Natural Gas Grill With Two Infrared Burners And Rotisserie. It was one BEAUTIFUL grill that took me some time and patience while taking apart and deep cleaning. The parts consisted of: cast iron burners with up to 48,000 BTU, flavor racks, ceramic briquettes, heat plates, flame throwers, LED grill lighting and a high end thermostat. 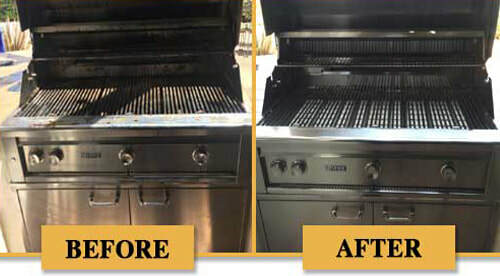 I take pride in the cleaning process on each and every grill I am assigned to so I had to thoroughly deep clean this customers Lynx and wanted to make sure his grill is working and looking as they did the day it was purchased. While taking apart this grill I had to be extremely careful when disconnecting each part and also be very detailed while I clean and reconnect the pieces. So after I deep cleaned his Lynx Professional and pieced back together the 30-inch Grill I then had to clean and polish up the stainless steel. Once I was done with the polishing and all parts were in place I started up the grill to show how great the grill was working and looking as I said it was like brand new! I like seeing how satisfied each customer is and that is why I do what I do! Another satisfied customer! After each completed job I always like to ask if there is any questions one might have and also I like educating so please feel free to ask me anything that comes to mind. I would like to have an opportunity to clean your grill as well should it be any name, make and/or model please give us a call and we will be more than happy to work for you! Things to do in Scottsdale during prime grilling months! The Barrett Jackson car auction is held at WestWorld just off of HWY 101 and next to the Ice Den Scottsdale. It attracts thousands of tourists and locals every year over the week's span. The largest day is Saturday, when it's standing room only in the main arena and some exotic cars selling for millions of dollars. I never miss this day! Also, you can buy all types of merchandise and view all of the other cars close up in the tents. Our company has cleaned BBQ grills at this event for some of the vendors. If you are ever in the area, you will want to stop by! Just a few weeks after the car auction is the Waste Management Phoenix Open. It's a PGA golf event that is the largest populated event on the PGA Tour. Saturday is also the best day to go as some years as many as 250,000 fans attend on one day alone! Phil Michelson is also the local fan favorite as he attended Arizona State University in Tempe AZ. March in Scottsdale Arizona has a lot of the MLB players and teams in town for Spring Training. Old Town Scottsdale is home to the San Francisco Giants and our home team, the Arizona Diamondbacks are very close to our shop at Salt River Fields. There are numerous other teams in town like the Chicago Cubs down in Mesa AZ. We always take our Barbecue Cleaners to at least one Spring Training game and enjoy hot dog and a beer. Did you know that we not only service the Scottsdale area, but we also service surrounding areas. 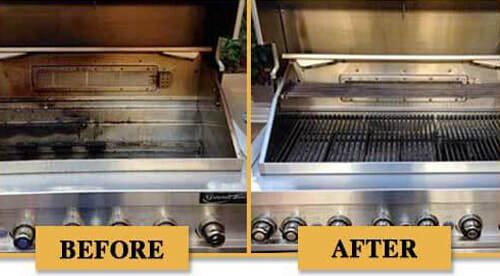 We are one of Phoenix's largest BBQ Grill cleaning companies. 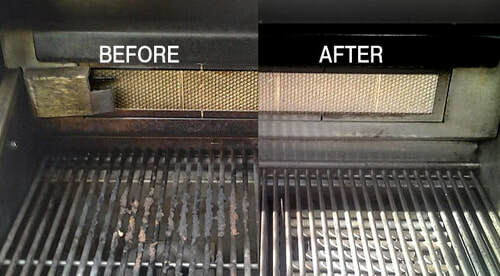 If you want your grill to look almost brand new again then please give us a call. 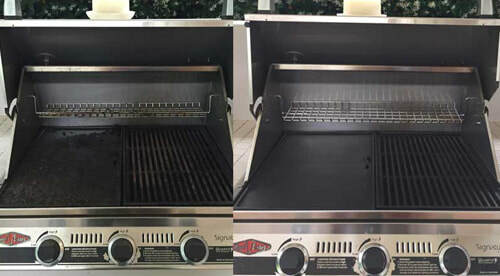 We supply parts and can restore your barbecue grill from non-working to almost brand new condition again. 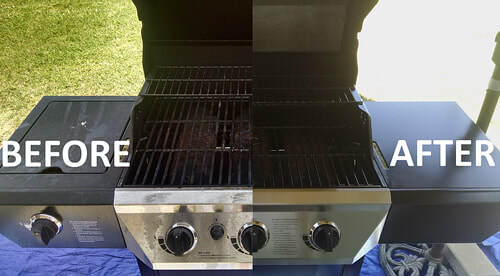 Don't embarrass yourself with a dirty Grill at your next backyard BBQ. 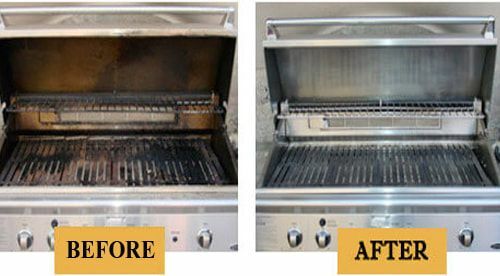 We clean and repair all types of BBQ grills in Phoenix. Our service area is all of Maricopa County including Tucson in Pinal County. 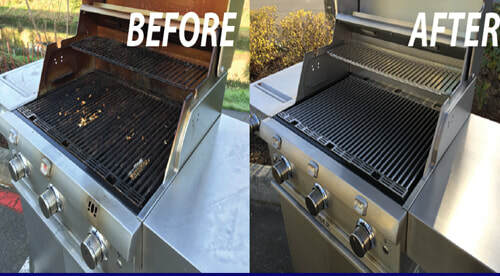 From Lynx BBQ grills to Viking BBQ grills all the way to a Weber grill we can restore any type of barbecue grill that you may have. So if you are looking for a barbecue cleaner near you then please contact us immediately. Problems with your barbecue grill in Phoenix? We get daily calls on barbeque related items like my grill won't start or I don't hear any gas... The most common problem to have with a backyard barbecue grill is the igniter. Some igniters are very easy to change. A lot of times it is just the battery that you can unscrew the top and change the battery. Other times, the electrode wire has been disconnected from your igniter. 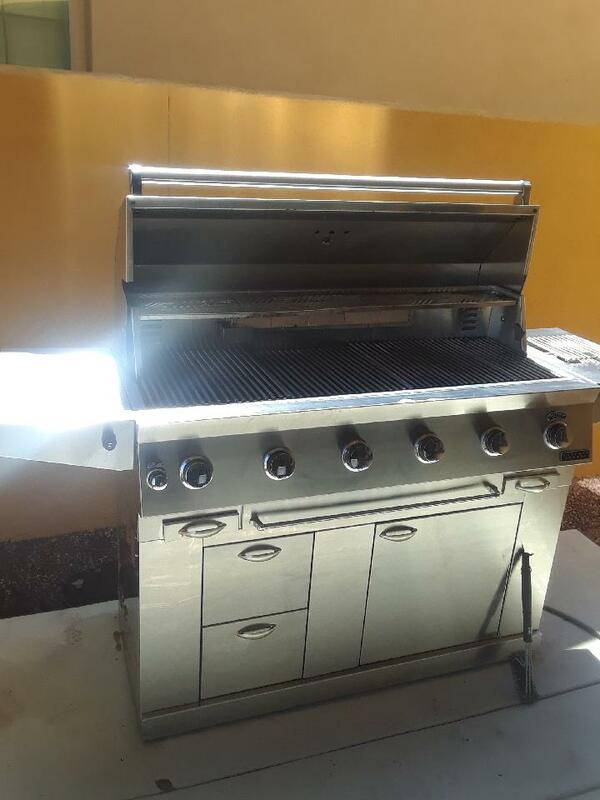 What does it cost to have my BBQ Grill cleaned in Phoenix? The grill cleaning cost depends on the size of your grill and how many parts it would need. 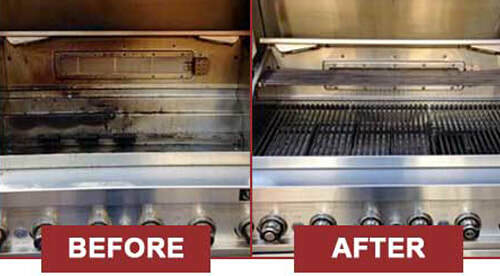 If you just need a standard cleaning and you have an average 36 in wide BBQ Grill, then that cleaning price would be anywhere from $195 to $250. On the other end if you have a large 10 burner Grand Turbo BBQ Grill, then the price might be closer to $350 to $400. Obviously if you need any parts on top of the cleaning, then that will be extra as well. But in the long run, we save homeowners thousands of dollars by restoring their barbecue grill so they do not have to spend thousands of dollars on a brand new BBQ Grill.